Around 50 percent of men and 20 percent of women are affected by age-related hair loss. 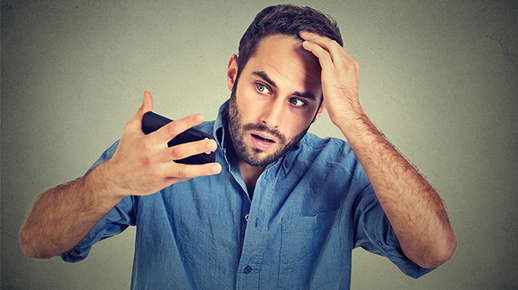 Although many people may think that balding is the same for everyone, genetic hair loss — rather than that caused by other diseases — tends to follow certain patterns. One common cause of hair loss is the male hormone dihydrotestosterone (DHT), which is made in the body from testosterone. In certain people, DHT causes the hair follicles to stop working, which leads to a loss of hair. This type of baldness tends to affect the mid-scalp and crown areas. The causes of other hair loss patterns are currently being researched. Pattern 1: The hair thins at the hairline and the crown area. As the thinning worsens, it forms a circle on the crown that spreads, with the hairline receding at the same time. These two bald areas will eventually meet in the middle, leaving a bald scalp except for hair along the back of the neck and head. This is the most common type of male pattern baldness, although there are many variations of it. Pattern 2: The hairline recedes toward the back of the head. The size of the baldness increases as the hairline moves back, until only the hair on the back of the neck and head are left. Pattern 3: Thinning occurs only on the crown, which forms a circle that spreads toward the back of the head and toward the hairline. Eventually, the scalp is bald except for the hair along the back of the neck and head. Pattern 4: In this hair loss pattern, the hair thins on the top of the crown and spreads sideways until the scalp is bald — or mostly bald — leaving only the hair on the back of the neck and head. This pattern occurs in women. Pattern 5: The hairline recedes from the sides of the forehead, with the bald scalp increasing backwards and toward the middle. Eventually, a patch of hair is left in the center of the hairline, which shrinks over time. In the end, only the hair on the back of the neck and head are left. If you are experiencing hair loss, whether it is mild or severe, schedule a visit to your hair care professional for help with finding a style that works for your hair.